Male Araripe manakins (Antilophia bokermanni) have bright plumage, while the females are olive green in color. Photo by Rick Elis Simpson. In an 11-square mile strip of forest on the slopes of a plateau in northeastern Brazil lives an entire species, considered by scientists to be one of the most endangered birds in the world. Now, 18 years after it was first discovered by scientists, conservation groups have acquired 140 acres of land to establish the first-ever reserve for the Araripe manakin. Six inches long with striking red, white and black feathers, Araripe manakins (Antilophia bokermanni) are found in forests near streams and springs along the Chapado do Araripe, a plateau with humid forest surrounded by a vast, dry landscape. Endemic to the region, the Araripe manakin was Brazil’s first species to receive a National Conservation Action Plan, making it a national symbol of conservation. 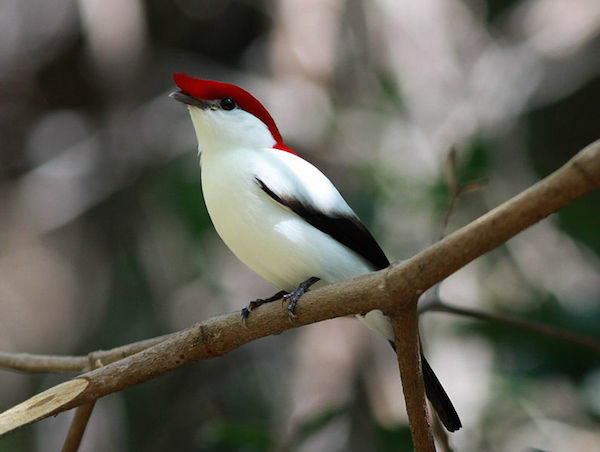 Censuses conducted in 2010 showed that there are about 800 Araripe manakins, all living within Brazil’s Chapado do Araripe. Because of its very restricted range, the IUCN lists the species as Critically Endangered. Human encroachment is a major threat to the species’ continued survival. Conservation Leadership Programme (CLP) reported in 2009 that among the human activities detrimental to Araripe manakins are forest fires, clearing of forests for agriculture – particularly for planting banana, maize and beans – and the conversion of springs to recreational facilities such as water parks. Other factors threatening Araripe manakin habitat include urbanization along the slopes of the Araripe plateau and landslides linked to heavy rainfall and deforestation, according to a CLP report. According to Global Forest Watch, the region comprising the Araripe manakin’s habitat lost approximately 50,000 hectares of tree cover from 2001 through 2012. Click to enlarge. The CLP report mentions that while much of the manakin’s habitat is legally protected, enforcement of those protections is lax. Calls to establish a permanent protected area for this species started in 2008, but it was not until late 2014 that Brazilian NGO Aquasis and bird conservation group American Bird Conservancy (ABC) were able to purchase suitable land for this purpose. “After 10 years of mapping the remaining habitat of the Araripe Manakin, we were confident enough to select properties that have all the desired features for this type of reserve: permanent springs and streams with prime nesting territories; good quality moist forest habitat; and good neighbors with excellent connectivity potential,” Aquasis director Alberto Campos said in a press release. According to Birdlife International, the purchased land was previously allotted for “sustainable use,” a categorization that made protection more challenging. 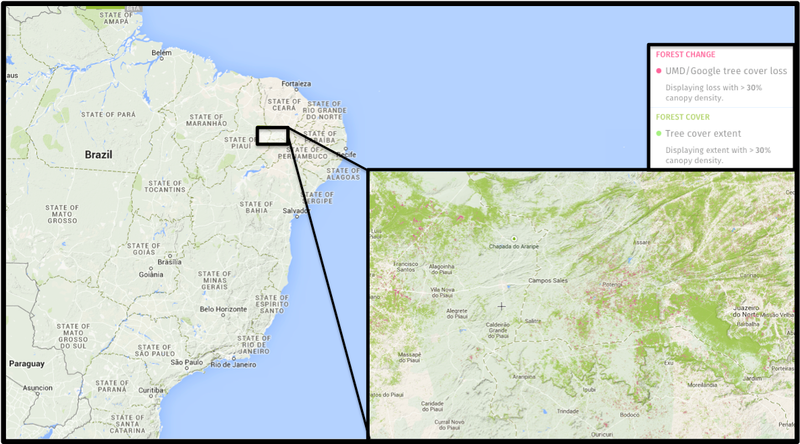 The 140-acre parcel that Aquasis and ABC acquired is connected with the state-managed Sítio Fundão State Park, and borders Araripe National Forest to the south. An adjacent landowner agreed to full protection for 27 acres of his land. 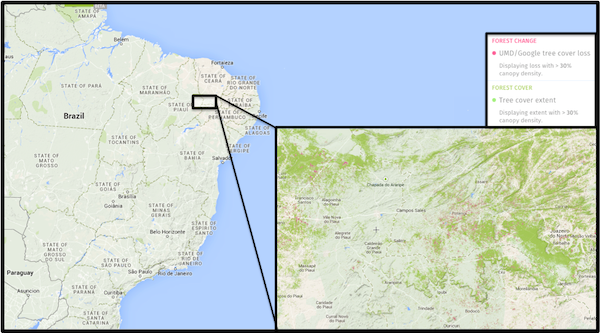 Aquasis is also in discussions with another nearby landowner to expand the reserve a further 60 hectares (148 acres). In addition to the land securement, ABC and Aquasis have made strides in reforesting disturbed areas of the Chapado do Araripe, with more than 4,500 native seedlings planted as of December 2014, and more planned. According to ABC, these conservation efforts will help preserve not only the Araripe manakin, but also other species that share its restricted habitat, such as the silvery-cheeked antshrike (Sakesphorus cristatus) and the white-browed antpitta (Hylopezus ochroleucus). Hansen, M. C., P. V. Potapov, R. Moore, M. Hancher, S. A. Turubanova, A. Tyukavina, D. Thau, S. V. Stehman, S. J. Goetz, T. R. Loveland, A. Kommareddy, A. Egorov, L. Chini, C. O. Justice, and J. R. G. Townshend. 2013. “Hansen/UMD/Google/USGS/NASA Tree Cover Loss and Gain Area.” University of Maryland, Google, USGS, and NASA. Accessed through Global Forest Watch on Feb. 10, 2015. www.globalforestwatch.org. Hansen, M. C., P. V. Potapov, R. Moore, M. Hancher, S. A. Turubanova, A. Tyukavina, D. Thau, S. V. Stehman, S. J. Goetz, T. R. Loveland, A. Kommareddy, A. Egorov, L. Chini, C. O. Justice, and J. R. G. Townshend. 2013. “Tree Cover Extent.” University of Maryland, Google, USGS, and NASA. Accessed through Global Forest Watch on Feb. 10, 2015. www.globalforestwatch.org. Péricles S. Rêgo, Juliana Araripe, Weber A. G. Silva, Ciro Albano, Thieres Pinto, Alberto Campos, Marcelo Vallinoto, Iracilda Sampaio, and Horacio Schneider (2010) Population Genetic Studies of Mitochondrial Pseudo-Control Region in the Endangered Araripe Manakin (Antilophia bokermanni). The Auk: Ornithological Advances. April 2010, Vol. 127, No. 2, pp. 335-342. (02/04/2015) To reduce logging pressures on the surrounding forest, several villages in the Lampung province of Sumatra have been conducting an experiment in community managed timber plantations on public lands. For the last 10 years, instead of logging the forest, members of the local timber cooperative have planted thousands of seedlings such as white teak and acacia in and among the surrounding villages. (02/03/2015) A year after it pledged a dramatic shift in how it operates in Indonesia’s fast dwindling native habitats, Asia Pacific Resources International Ltd (APRIL) continues to destroy forests and peatlands in Sumatra, allege environmentalists. (01/29/2015) Television inspired Syafrizal to act. As he watched report after report of land conflicts exploding in Sumatra and Kalimantan, he realized nobody was safe, and his village might be next. (01/23/2015) The rolling green hills covered in rice paddies and coffee plantations give Semende in the Muara Enim regency of South Sumatra a welcome and hospitable feeling. However, behind the peaceful pastoral veil, is a history of rampant forest encroachment and land conflict in the Barisan mountains. (01/21/2015) The forest behind Indudur village clings to the steep hillside. The topography itself is enough to protect it from most common threats of development. However, the area is under attack by a more pernicious force: a lack of interest by the younger generation in earning their living here. The difficulty of life compels many to migrate out, leaving the village dominated by older people. (01/13/2015) Researchers working in Kerinci Seblat National Park have captured a remarkable image of a mother Asian golden cat (Catopuma temminckii) carrying her young in her mouth. 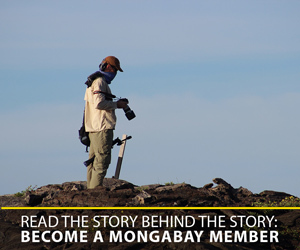 The image was taken in mid-2014 as reported by Mongabay Indonesia by the Sumatran Tiger Research Team.